In 2017, the purchase price of still wine in France amounted to about 2.7 euros per liter, all types included. The average realized price of still wine remained fairly steady throughout the years until 2014, when it decreased to below three euros per liter. 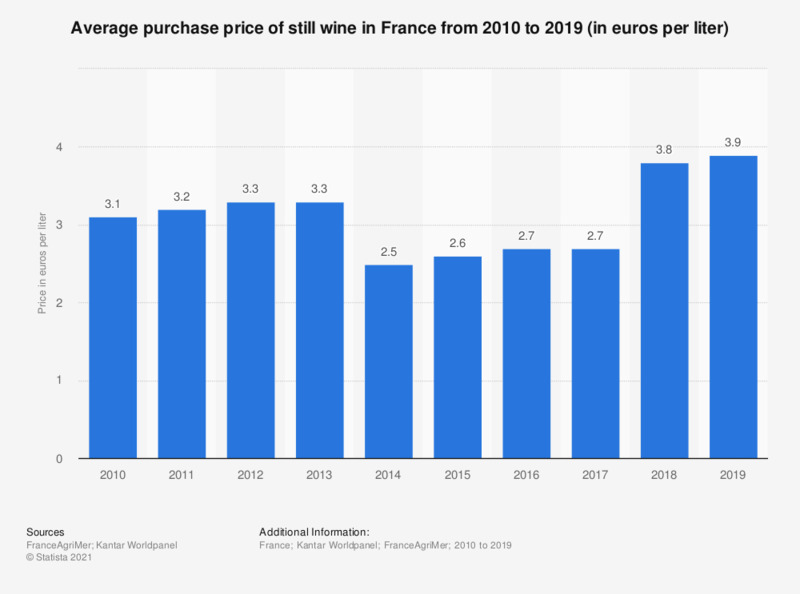 The average price serves as an indicator for a variety of different selling prices on the wine market, gathering all price ranges of still wines purchased in France. Still wine is the type of wine which does not sparkle when opening the wine bottle. According to the French legislation, this type of wine does not exceed 15% per volume (or 18% per volume without enrichment process) and is only obtained through an alcohol fermentation process. French households spend in average 126.6 euros for still wine purchases in 2017. This expense had dropped since 2012, when the average household budget for still wine amounted to 134.1 euros. Nevertheless, French remained the biggest consumer of still wines within the European Union, with 23.3 million liters consumed in 2017.